"Although microvertebrate accumulations are commonly used for paleoecological reconstructions, taphonomic processes affecting the final taxonomic composition of an accumulation are often ignored. This research explores the effects of abiotic taphonomic processes on the taxonomic composition of terrestrial microvertebrate accumulations by comparing a floodplain and a channel lag deposit from the Maastrichtian Hell Creek Formation in eastern Montana. Distribution of skeletal elements with specific physical attributes and relative abundance of taxa correlate with the hydraulic indicators (i.e., grain size, sedimentary structures) of the depositional facies. Transport distances, hydraulic equivalencies of dominant skeletal elements, amount of hydraulic sorting and reworking, and degree of time averaging vary between deposits and significantly affect taxonomic distributions. Relative abundance data, in conjunction with chi-square test results and rank-order analysis, show that size, shape, abrasion, and taxonomic compositions vary significantly between assemblages. The fine-grained assemblage is dominated by tabular, low-density elements, such as cycloid scales and fish vertebrae. Dense, equidimensional elements, such as teeth and ganoid fish scales, dominate the sandstone assemblage. Rank-order analysis results demonstrate that relative abundance of hydraulically equivalent skeletal elements from morphologically similar organisms can be compared regardless of accumulation in nonisotaphonomic deposits. Statistical comparisons were made among osteichthyans using ganoid scales, caudates using vertebrae, ornithischians using teeth, and testudinates using shell fragments. Results show that portions of the assemblage analyzed using hydrodynamically equivalent elements are not significantly different, despite different depositional environments." Now this is my kind of accident to come up on! I hope they had some BBQ sauce with them! "Twenty-five tons of beef ribs went up in smoke overnight after the truck in which they were transported caught fire south of Chicago. Illinois State Police Master Sgt. David Bird says the blaze was ignited in the semitrailer's breaking system early this morning. It spread and consumed the entire trailer, turning the 50,000-pound meaty load into a massive barbecue alongside the interstate. The truck's driver wasn't injured." Good for them for standing up for something they believe in! "Madison Vorva and Rhiannon Tomtishen, both 12, started doing research last fall on endangered orangutans in Indonesia as part of their Bronze Award project. They discovered that the habitat of orangutans is being threatened by conversion of the land to the production of palm oil, which is an ingredient in Girl Scout cookies...."
Testicle bill dangles over Fla. legislators - Ban on trendy replicas on trucks: Good policy or anti-freedom? I hate these things, it would be nice to see them gone! Glad to hear other states are looking to ban them as well. They are so stupid that I do not even want to post a picture of them here, but I am sure if you Google it you can find some. "They're proudly displayed by any self-respecting bull, but dangling big metal ones on the back end of a truck could be banned in Florida. Metal replicas of bull testicles have become trendy bumper ornaments in some parts of the Sunshine State, but state Sen. Carey Baker is campaigning to ban the orbs...."
If you are on Facebook, you can join the Switching Gears w/ Junior group! See you there! In episode 2 Chris and Ron are joined by Dave Schumaker from Geology News. They discussed plagiarism, earth day, gas prices, alternate energy, oil shales, and Where on Google Earth. Check it out!! The next PodClast will be recorded on May 3 so be sure to keep an eye out for that! I have never seen Easy Rider so all the way through, hence its absences. What are some of your favorites? Anyway, this week I thought I would participate in the Scientiae Carnival, which is hosted by a blog that is all about "Stories of and from women in science, engineering, technology and math." Below are my responses to the topic "our changing views of ourselves and our careers as we progress through life." How have your career goals changed in the past year? 5 years? 10 years? My career goals... Boy, where to start on this one. Ten years ago I was finishing my senior year of high school. I was all about getting out of Arkansas, moving to Montana and starting my paleo studies. 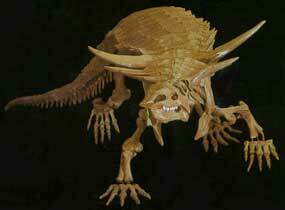 I knew that I wanted to do vertebrate paleontology and I was going to major in geology and biology to get me there. That was never a question. I moved to Montana and started my freshman year at Rocky Mountain College in Billings. Of course I wanted to go to the mecca of paleo school for all undergrads, Montana State, but my parents convinced me to go to Rocky because it was associated with the Lutheran/Methodist church and we could get me more scholarships there for me (my dad is a Methodist preacher). As it turned out, that school was way too expensive, so I didn't last but a semester there. And where did I end up - back in Arkansas. Ya. There were other 'circumstances' of course that got me back there, but it was a pot hole in the road to getting where I thought I wanted to be. I went to the local community college for a year, and then I moved up to Fayetteville to attend the University of Arkansas. I always swore I would not go to school there, but I was stuck in Arkansas at that time. I lucked out and found a really great spot for myself in the geology department there and they all became sort of an extended family. There were only two vertebrate paleontologist in the entire state of Arkansas at that time (2000), and I was one of them (Dr. Leo Carson Davis was the other)! It was while I attended UofA that I was able to learn how to do research and was in an environment where the people around me stimulated me to do work and continue to climb the paleo ladder. I attended my first Society of Vertebrate Paleontology annual meeting (SVP) while I was an undergrad in 2001 and presented a poster at the next years meeting over my very first research project. I remember how excited I was when I saw my first published abstract in JVP (Journal of Vert Paleo)! Going to SVP as an undergrad, completely alone and without knowing anyone other than my fellow Arkansas paleontologist (both of them – Blaine Shubert had joined us by that time), was an experience I will never forget. I just walked around and talked to anyone and everyone I could. I met so many people there that I know call my friends. While I was at Arkansas I did a senior thesis on the only known dinosaur remains from Arkansas. My advisors, Walter Manger and Doy Zachery, are invert paleo and stratigraphy guys and they helped me best they could with the projects and were great mentors, as was Dr. Carson Davis. I feel as though I really learned alot from them and I am thankful to have landed there. Five years ago I graduated from UofA and moved on to Grad School. This was a bumpy time of my life. I had many people in my life pass away in a very short amount of time during grad school. The competition in my program was something new to me, since I had been the only vert paleo person where I had came from. I am not a fan of competing against other people, and in the end, I felt as though I had gotten the short end of the stick because I did try to be more independent and not ask for as much help as maybe I should have. The level of mentorship and comradery I had gotten use to at Fayetteville was not present in at my new school. I felt much more like I was on my own in every aspect, which I know can be good and will make you more self reliant. 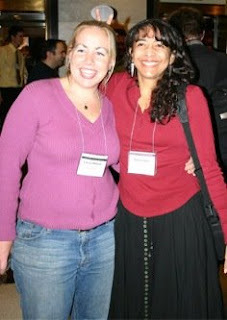 Not to say I did not make friends there - I did! But we have all pretty much seemed to have drifted away and only speak on occasion (I am still very much in contact with several folks from my undergrad days). My grades as an undergrad were not stellar (not a 4.0), and my GRE scores were also not spectacular, so I did not have funding for my first year of my masters program. Instead I worked two jobs to stay afloat while going to classes. It was very difficult. In the end I was able to prove my worth and they gave me funding and a TA position for my second year. I really enjoyed teaching my labs and I was glad I had the experience. When it came time to develop other skills you should learn as a master’s student, I feel as though I fell short (such as improving your writing process, building on your research skills...). Once again, maybe this was my fault for not asking for more help. I thought it was better if I showed I could work as an independent researcher. Who knows what the right thing to do would have been. Hindsight is 20/20, right? I was able to finish my program in two years and was very happy to have it over with. I had big plans to continue on and climb up another rung on the paleo career ladder, but someone else had other ideas for my future, so that, combined with my GRE scores, have kept me from moving forward as I had always intended and planned to. Due to the public nature of this blog I will not go into gory details (I really wish I could, its something I truly need to let go of and stop carrying the hurt around inside me). I was just not admitted to any programs due to the GRE scores and individuals strong opposition against me going on. This person had the pull and in the end I felt very hurt, confused and betrayed, even though I know they thought they were doing what they should have. I wish they had just initially said that they did not support my plans and I would have made other arrangements, but how was I to know when they did not seem to have a problem with it when asked for their help the first time. This person did encourage me to peruse my other skills, which I have, and that seems to have worked so far. Without a PhD program to move on to, I felt lost. What was next!? My plans had been totally messed up and I just really had no idea what the next step was. I felt like the rug had been pulled out from underneath me and I was hanging there in mid air. I didn't know if I would fall to my death or land on soft ground. Luckily for me, soft ground found me in the shape of my favorite place on this entire planet - Glacier National Park. I was able to get a great job there as the park paleontologist and geologist the summer after graduation (2005). It was exactly what I needed and gave me some peace in my life that I was severely lacking at that point. There was still this huge void out there, lurking, waiting for me to fall into its dark depths - the point of "now what!" after the seasonal job ended. I interviewed for two paleo jobs in Utah, but got neither. 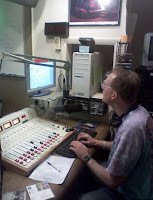 Then, as luck would have it, I got the gig I have now at Augustana College working for Bill Hammer. My job here has been great for my moral and general self confidence, and I have felt like actually doing research again. Hammer has been very helpful and has encouraged me to do more field work, research, teaching, and I have really had a chance to improve my preparation skills. I have learned quite a bit from this job and from him, and above all I have learned that I am good at what I do, and I do not have to posses a PhD to prove that to anyone. I am who I am. I may not be able to conquer the freaking GRE, which really schools and individual’s weight far too heavily (in my opinion, probably a bit bias). I am good at research. I can do certain things well. Something’s I need work on, but that is life. I am a good at prep and that is a skill that not everyone can do. People can not do research on fossils unless they are properly cared for and cleaned first. In spite the views of some paleontologist, fossil preparators are just as important as the person that does the research and they should be treated accordingly, rather than looked down upon as a "lesser" and not even considered a paleontologist by some. I am glad I was able to find this thing that I appear to be good at. I enjoy it, it gives me solace and clarity when my brain will just not shut up, and it has allowed me to stay in paleo and continue to work towards my goals. The past ten years have really been an adventure. It’s had its great and its very bad points. I have learned that they are some really great people out there who want nothing more than to help you get where you want to go and will encourage you every minute of the way. There are also others out there who are evil, crazy, carry so much hate around in them they try to push it off on anyone they come in contact with, and who are really only there to bring you down and screw you over. It’s up to you to know which is which and who you should surround yourself with. How has your perception of self changed in the past year? 5 years? 10 years? Ten years ago I had these grand plans. I was going to get my PhD before I was 30, be successful, married and the happiest person in the world. Wow, has my perception changed!! I have accomplished quite a bit. I do know that. I have a master’s degree and I worked hard to get it! Five years ago I still thought I was on the cusp on being able to fulfill all my dreams and that grad school was going to help me do that. It didn't (entirely). What I have learned about myself from that time is that I am a stronger person that I give myself credit for. I now know that there are certain things I am good at; really, really good at. And there are other things that I am just really bad at. Unfortunately what I think one needs to succeed and what the 'standardized cookie-cutter paleo student' image that everyone thinks you have to be to fit the "professional paleontologist" image are not the same. I guess I do not fit into the box ‘they’ want me to. But I know I have the support of many people and that not everyone is “out to get me”! I feel truly lucky for the friends and colleagues I have. They help me to be a better person and a better paleontologist. I do not think I am any less ambitious that I was ten years ago, but maybe now I have a better understanding of how the paleo machine works. I just have to find my place within it. I might not get to the highest rung of the ladder, but I know I have not fallen off of it and will keep doing my best to better myself and achieve my goals. I am who I am. I have had a paleo related job every day since I graduated and I know I am super lucky in that respect! So many don't. I even got to turn down a job! I may not have accomplished all of my goals, but I think I am still doing pretty well with the hand I have been dealt. How much of a role have things outside of science had on your changing career goals? Early on I let may outside factors rule my life. I changed schools more than once to accommodate other people (significant other). I delayed things I wanted to do for other people (significant other). It got me no where unfortunately. I had a long relapse in there, but I was able to climb back and I think I am doing pretty well for myself. I can’t blame it all on others. My brain and I are not always friends, and sometimes I am just not smart enough to get where I want to be I guess. I wish I were more intelligent, articulate, or better at playing the game. I finally figured out that I have to work with what I have been given. I had to learn to love myself for who I am. I can not make my brain work any better than it does. I can try to learn and improve, but I am only what I am. And I have to accept that. While I am about to give up a job I really love for a man I really love, I know that I am not giving up a part of myself in the process, and that is the most important thing that I never did before. This new chapter is only going to help me continue to pursue my goals because this time I know I have this individual’s utmost support and encouragement on all levels. My goals might have been delayed some, but they are still there. So, this is a bit longer than I intended it to be. I hope I have not bored you to tears. Thanks for reading. Feel free to comment if you like. I always like to hear what others think about my long ramblings…. I am slowly getting my website updated. It has been pretty neglected as of recently. I finally have my pictures from the First Annual Fossil Preparation and Collections Symposium at Petrified Forest National Park up. I hope to get some of this past summer/falls pictures up as well, including my hike up to the Burgess Shale/Walcott Quarry, Ceratopsid Symposium, Jamaica, and Colorado field work. I'll keep those who might be interested updated. The next 10 minutes, the couple fought off the bobcat before Thompson pinned it to the ground with a stick and killed it with a hammer from his backpack. Tests later determined the animal was rabid. "I knew immediately it was a rabid bobcat and we were in trouble," Thompson said. "I have no idea,'' he said. "But it was totally obvious to me." While there was no frothing at the mouth, the cat's behavior was odd, Thompson said. It was not afraid of the hikers. They tried to get away from the bobcat, but it pursued them. It lunged at Mangin, climbing up her legs and wrapping its body around her, clawing and biting. "It just jumped on me and sunk its teeth in my calf," she said. "It seemed unreal. I grabbed it off of my leg and threw it. It jumped back on me. I was screaming and gasping. I was so terrified." Thompson used his backpack to knock the cat off his wife. He hollered for her to take the dogs, which stood by during the attack. Mangin and the pets ran up a hill, with the cat in pursuit. Thompson got between the cat and his wife, and it jumped on his back. "I hit it with the backpack over my shoulder," he said. The cat fell to the dirt and lunged again. "It attacked me again, and I threw it down." Thompson finally was forced to kill the animal...."
Mickey Rowe (co-owner of the Dinosaur Mailing List) encourages you to continue thinking about Aetogate and to contact New Mexico Governor Bill Richardson (don't let it fade away, although we do eagerly await the results of the SVP Ethics Committee). I truly do not think that Bill Parker and Jeff Martz are trying to raise a stink over nothing. They are honest guys with nothing to gain from this. I think what it boils down to is that they never want to see anyone worry about being scooped or have to fear for the safety of their research ever again. And, really, that is not too much to ask. No one should ever have to fear for their research or retaliation from their scientific elders or peers (even if it is for disagreeing over Aetogate or any other issues). In fact, it is noble that they have put their necks and careers on the line to stand up to what they perceive to be an injustice. If you do not know about Aetogate you can catch up here and here. If you are interested in writing to the governor you can find a sample letter here. I am going to be out of town for the next several days at the Geological Society of America North-Central Section meeting in Evansville, Indiana. Post will be light, if not non existent. Have a great week! Mike Gravel was born on May 13, 1930 (!). He served the state of Alaska as a Democratic Senator in the U.S. Senate from 1969 to 1981. He is primarily known for his efforts in ending the draft following the Vietnam War (Yea for that!). While a Senator, Gravel spoke the Pentagon Papers into public record. On March 26, 2008, he announced he would no longer be running for president as a democrat, but as a libertarian (had to look that one up), citing differences over the war in Iraq. Then it tells me I am 78% similarity with Hillary and 76% with Barack. Interesting. Not that I am going to base my vote on what a quiz tells me to do. But still, interesting. I have never heard of Mr. Gavel to be honest. No offense to him, but when I saw "1930" I realized the dude is pretty old and has seen quite a bit I am sure. Plate Tectonics didn't even exist yet when he was a kid (well, he's not that old - they existed, it was just not a recognized theory yet)! I thought McCaine was old, but this guy takes the cake. I wonder why I have not heard of him till now (other than that heavy rock I live under), since we seem to have similar values. I would be interested in hearing where others fall out in this quiz, if they like to share their results. Nalgene - Now what? Why no buy-back option? I can't think of a single geologist/paleontologist I know who has not owned at least one Nalgene bottle sometime in their life. I know I am the owner of at least 5. But now my "cute" newer colored Nalgenes are forced to find a new use due to their condemned status. In case you have not heard, some Nalgene's contain the chemical bisphenol-A (BPA) - a common building block of hard polycarbonate plastics. To check and see if your bottle contains BPA just turn it over and look for a '7' inside a triangle design (see picture). Nalgene announced Friday that it will phase out the use of BPA in their bottles and offer this website to help you find a new alternative (at your own cost. See the last paragraph of this blog for other alternative water bottles.). It would be nice it Nalgene would take the initiative to offer a buy-back program where we could turn in our #7 bottles for safe ones, to help offset our cost. I know I bought my bottles because I knew they would last for a very long time. And now more than half of my bottles are useless for the purpose I bought them for. Rather irritating! What am I going to do with them now? I am hoping someone at ReadyMade turns it into a contest. Who knows, maybe I will turn them into lamps or pencil holders, or something (offer some ideas, please!!). "Because BPA mimics estrogen, there has been increasing concern that exposure, especially by fetuses, newborns, and infants, may cause long-term health impacts such as early puberty in girls, reproductive problems, and cancers later in life." "...Canada’s Minister of Health, Tony Clement, declared that the Canadian government is taking action to reduce BPA exposure, especially in newborns and infants. “We have immediately taken action on bisphenol-A (BPA) because we believe it is our responsibility to ensure families, Canadians and our environment are not exposed to a potentially harmful chemical,” said Clement. side note: So, why are those "..my last Nalgene Bottle"s stickers on my bottles (see top picture)? Last summer I went to a hippie fair at a park in Boulder, which I really enjoyed. There were all sorts of folks there, including PETA and Rock Mountain Animal Defense (RMAD). I am not a vegan or even a vegetarian, don't get me wrong, I love my meat, as many of you who know me can attest to. If veggies would evolve to taste good I would love to just eat them and let the animals be. I think being a vegetarian is a great idea in theory, just not my thing. Anyway, the RMAD People showed me an article about Nalgene making contraptions to hold bunnies for lab testing and other animal testing supplies. NOT COOL! ("Nalge dropped this device from its catalog shortly after the boycott began. RMAD has been unable to confirm, however, that the company in fact no longer sells it."). Nalgene counteracts by saying: "Nalge Nunc International realizes that animal research is essential to medical research. There is no laboratory procedure or computer simulation that can reproduce the complex systems of a living organism. There is nothing short of controlled animal research that can prove the safety and efficacy of a drug or surgical procedure. Without animal research, there would be no polio vaccine, no heart by-pass surgery, no chemotherapy and no insulin. Without animal research, we will never be able to cure AIDS, multiple sclerosis or Alzheimer's." Some of these comments are misleading (details here, half way down page). And, as I like some animals more than some people, I do not see the point in animal testing. Why should convicted murders get a free ride in a state owned 'hotel' (although not as cushy)? - put them to use. Ok, so maybe thats a bit harsh. I just think with all of our "intelligence" we could find a way to do things without hurting the other organisms that we share the planet with. Why are we so superior? So, if that bothers you, check out the GSI Outboor lexan bottles (recommended by RMAD) or the Klean Kanteen. RMAD notes that "The GSI Outdoor bottle, like the Nalge bottle, is made with a polycarbonate plastic developed by General Electric, a multi-national corporation that is the subject of numerous boycotts. The difference between GSI and Nalge is that Nalge supports and directly profits from animal research." I also can not confirm that they do not contain BPA, as I do not own one, so look for the #7 on the bottom before you buy one or contact the manufacture. The Klean Kanteens "are made from #304 stainless steel, the material of choice in the food processing, dairy, and brewery industries. Stainless steel is easy to clean, durable, inert, sanitary, toxin-free, and non-leaching. "[link] Unfortunatly, they are made in China. I guess there is always the good and the bad. 5.2 Earthquake? Ya, I slept though it. Ya, I guess I missed it (I live in the Quad Cities right now, above the "LL" in the picture to the left). This earthquake (a 5.2 the USGS reports) was in the Wabash Seismic Zone (not the New Madrid seismic zone, my bad - thanks to Erica for pointing that out). And I have to sleep though it (*see update below). Bummer. Its probably a good thing though. I do not like earthquakes. Kelty knew something was up though and was acting weird all morning (I thought she just wanted attention). It was reported at 4:37am southeast of where I am living right now in the quad cities, although I guess folks here felt it. There were two aftershocks, a 2.6 and a 2.5. I missed those too. "The strongest earthquake recorded in Illinois was in 1968, a 5.3-magnitude temblor centered near Dale in Hamilton County, about 75 miles southeast of St. Louis, according to the USGS." Thats not far off from what we had today, but they had damage back then (sounds like it was very minimal this morning)." I think I am suffering from lack of tornado season/spring destruction. Its like missing Christmas or Easter - feels like I am living in a different country or on a different planet this time of year. My space time continuum has been interrupted. Two fossils for sale have recently been in the news. One is a Triceratops that went up for bid Wednesday in Paris. It is from a private collection, a 'museum' that the owner has in his home in South Dakota. The fossils did not sell, so I assume it will be returning to the living room of someone with more money than they know what to do with and who has no value for scientific research. Things like that make me very bummed. Tax write off dude – just donate it to a museum! Another story was forwarded to me last week while I was out of town (thanks Jack!). The Blackfeet Nation (Reservation) shares most of its western border with Glacier National Park, and there are known outcrops of the Two Medicine Formation all over the res. Fossils have been found quite often on their land, with many being sold to factions such as Canada Fossils. Prenoceratops pieganenis* comes to mind as important fossil (the first basal neoceratopsian bonebed) that has been sold from the tribe lands. It appears that now they are planning on selling (or trying to sell) another fossil from their lands: a juvenile tyrannosaur, "Cameron" (see picture below), discovered in 1995. The fossils have been on display at the Blackfeet Heritage Center in Browning, right next door to the Museum of the Plains Indian for the past few years. I had no idea! I have driven by the center so many times and never had any idea it was there (I lived in the park in 2005, and was just though Browning back this past September), let alone that I should maybe go inside and take a look around. I think this is a missed opportunity for the tribal people (more on that below)! "From vintage automobiles to antique weathervanes, the rare collectible market offers a haven for investing if done wisely and if placed in only the finest and rarest specimens but no venue of this field has more promise than that of collecting rare fossils. In comparison to all other rare collectible markets, it is one of the MOST UNDERVALUED markets….Despite what some scientists or 'anti-private ownership' individuals may tell you to discourage the fossil trade, the highest quality and rarest fossils DO APPRECIATE and their value goes up each and every year. This is simple logic. They are not making fossils any more. …This transpires while collector demand for only the finest quality specimens drives onward, forcing values and prices higher as time goes on. …"
Ick, I want to puke. I guess I fall into their "scientists or 'anti-private ownership' individuals" category. It's people like this who are making science more and more impossible and think that everything has to have a dollar value assigned to it. To them it is just another untapped market that they can make a buck off of, regardless of what suffers. I truly do understand the plight of the Blackfeet Nation. I have been to their land and seen first hand how they live and the conditions many are faced with. I also grew up in Oklahoma ("Indian Territory" - mass exodus destination for many tribes), have a bit of Indian in me, and have seen my fair share of 'good' and 'bad' reservations (still, I know I am not an expert, this is just my opinion). It is all very sad. However, as an alternative to selling off their fossil and their tribal treasures, I would rather see them erect a museum to showcase these things properly (or work it into a permanent display at the Museum of the Plains Indian)! With the close proximity of Glacier National Park and the high volume of tourist traffic Browning and the reservation get every summer (spring to fall even), I think, if done correctly, they could make a killing! Displaying the fossils from their land proudly would give the Blackfeet the financial backing they need, while also promoting education and science! I realize the debt they are in and it would financial backing, but I think if a project were put together with tribal support it could be a success. Training the local tribal people to give informative tours, and in excavation, preparation, collections management, and research techniques could also help to promote a wonderful community of learning for the Nation! The biggest problem would probably be finding someone the tribe felt they could trust to help them get up and running, and someone who would be willing to let them take the reins once it is going the direction it needs to be (and not take advantage of them or their situation). I believe it would need to be an internally managed tribal project to ultimately succeed however. (The current management problems would first need sorted out!) Partnerships with other local and state museums could also be beneficial (sharing specimen cast for example), if done in a non threatening/dominating/controlling way. I truly hope that they will take the pros and cons and look into keeping their fossils and properly promoting and advertising them for themselves. If I had known that Cameron was at the Blackfeet Heritage Center I would have stopped to see it! Good promotion and advertising is paramount when you are a small museum. I say keep the money where it needs to be – on the Blackfeet Reservation for the Piegan people! It may not get them $5 million dollars fast, but in the long run it will be far more valuable! * Chinnery, B. 2004. Description of Prenoceratops peiganenis gen.et sp. nov. Dinosauria, Neoceratopsia) from the Two Medicine Formation of Montana. Journal of Vertebrate Paleontology 24(3): 572-590. What is a PodClast? Basically is is several folks from the geoblogosphere who are getting together to talk about recent geology stories in the news. In the first episode, which took place on April 13, Chris Town (from the blog "goodSchist") and Ron Schott (from the blog "Ron Schott’s Geology Home Companion") got together to talk about "recent volcanic activity on Kilauea, Hawaii.... the pros and cons of peer-reviewed papers and ... career opportunities for people entering the professional geology world." The next episode is scheduled for April 26th. The customer paid and walked out with his monkey. 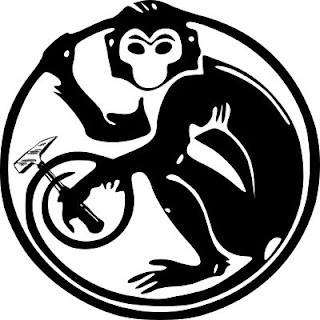 Startled, the tourist went over to the shopkeeper and said, "That was a very expensive monkey. Most of them are only few hundred dollars. Why did that one cost so much?" "Oh, that one's a P.Geo - a professional geologist - is can log drill holes, update and construct geological models, they are experts in igneous and metamorphic petrology and petrography, hydrogeology, sedimentolgoy and structural geology. SOME can even do basic calculations. All the really useful stuff," said the shopkeeper. I am back from my trip to Petrified Forest. It was a GREAT meeting! I will post an update on the meeting along with some pictures soon. I am still playing catch-up. Hope to get back to blogging soon! This week I will be attending the Petrified Forest Fossil Preparation and Collections Symposium. You can see a complete list of the talks and posters that will be presented here. I anticipate a lack of internet, so there will probably be a lack of postings till next week. I'll be sure to take plenty of pictures and report back on the meeting. Have a great week! There was a time in my life (ya, it was high school) when I was really into level 4 pathogens. I mean, really, really into them. I would gobble up any book I could find on the subject and for a few moments I thought it might be more fun that paleo. Then I realized that the study of these viruses are typically to discover a "cure" and to me, as harsh as it might seem, we need these viruses (and I am not always a huge fan of the general human population as it is). I think of them as mother nature’s way of trying to curb our worlds population, which is already somewhat out of hand. Not trying to be cold hearted or mean, it’s just a fact. And if I ever catch the plague and die, I will realize that this is just the way it is. Anyway....this leads me to the topic of this blog posting, a story that caught my eye the other day. A cure for Ebola? One of the most gnarly and harsh pathogens we have out there, is it a good idea to have a "vaccine" that we inject people with so they can work in "hot zones." Sounds like the set up for your typical zombie movie (think 21 Days Later or I am Legend). I think it is just a mater of time before we manipulate viruses to much and it all backfires on us (more sci-fi fun from The Stand, The Andromeda Strain, Outbreak, ect…I can’t remember them all right now). Time for another extinction event? So far, there have been over 1500 cases of Ebola haemorrhagic fever in humans. Illness starts abruptly and symptoms include fever, headache, sore throat, weakness, joint and muscle aches, diarrhoea, vomiting and stomach pain. A rash, red eyes and bleeding may also occur. 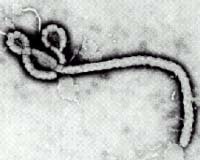 Ebola haemorrhagic fever can have a mortality rate of around 90% in humans. Because Ebola virus is so dangerous, producing and testing a vaccine is extremely challenging for the scientists. One significant factor slowing down progress has been that there are only a very limited number of high containment facilities with staff capable and authorised to conduct the research. "Ebola virus is a Biosafety Level 4 threat, along with many other haemorrhagic fever viruses", says Dr Sanchez. "As well as the difficulty in getting the right staff and facilities, vaccines for viruses like Ebola, Marburg and Lassa fever have been difficult to produce because simple 'killed' viruses that just trigger an antibody response from the blood are not effective. For these viruses we need to get a cell-mediated response, which involves our bodies producing killer T-cells before immunity is strong enough to prevent or clear an infection." The researchers have now used several different recombinant DNA techniques, which have allowed them to trigger a cell-mediated response and produce a vaccine that is effective in non-human primates. One of the candidate vaccines is about to be tested on people for the first time, after entering Phase 1 clinical trials in autumn 2006. "Ebola virus infection of humans can be highly lethal but monkeys rarely survive the infection and have been very useful as animal models. Ebola vaccine trials using nonhuman primates have provided unambiguous results and have allowed the development of protective vaccines to progress rapidly", says Dr Sanchez. "Successful human trials will mean that we can vaccinate healthcare workers and other key personnel during outbreaks of Ebola haemorrhagic fever, helping us to protect their lives and control the spread of the disease"...."
The rat has been adopted. Glad he found a home. Now I will know more details next time, should I see one in need of a home. Thanks! I am thinking about adopting one. Does anyone out there know anything about keeping one? This particular rat could no longer be cared for by his family, so he was looking for a new home at PetCo today. And he looked sad. His name was Templeton (appropriate). I am a sucker for homeless animals and would take them all home with me if I could. I have really missed the absence of Teebo (my guinea pig) and Whitley and Woodstock (my cockatiels). I have wanted to get another bird for a while now, but realize I should wait till I am moved to do that. I also really (really!) want a dog, but we need to wait till we have a place with a yard. I am terrified of mice, but a rat is larger and more like a guinea pig with a tail (right?). I worry that Kelty, my cat, might enjoy it to much, but she was always nice enough to Teebo. So, my question to you readers is this: are rats good pets? Level of easy needed in care? What do they eat? Are they nice or pissy? Since I am on a LOL kick this weekend, why not throw in some Star Wars pictures [link]. I know Travis will at least appreciate these. Reposted from here & here. 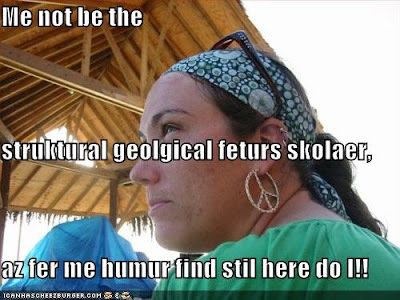 While I am not a structural geologist, I still find the humor here. Translate your own speak into LOL here. More research by the Glacier National Park USGS group! I was able to see an early presentation on this work back in 2005 when I worked in the park. You can read more about the Northern Divide Grizzly Bear Project here and more information on the Grizzly Bear DNA Project here. ".... Between 2005 and 2007, Kate Kendall of the U.S. Geological Survey and her colleagues took video footage of black and grizzly bears doing what looks like the go-go at their favorite "rub trees." They also got film of bears lumbering beneath stretches of barbed wire used to snag hair samples. The research is part of a larger study to estimate the population size and distribution of bears in northwestern Montana using genetic analyses of the bears' hair samples. Scientists think bears shimmy their backs against trees in a kind of bump-and-grind to scratch hard-to-reach spots and to communicate their presence to other Ursus kin. "It's probably primarily a form of chemical communication," Kendall said. "Often bears will sniff the trees before and after they rub on them." Though Kendall has yet to pinpoint exactly what makes for a bear-loving rub tree, both grizzlies and black bears seem to agree on the specs. "Multiple bears are using the same trees, including within the same day black bears and grizzly bears," Kendall told LiveScience." Its that time of year again! It's times like these I miss living back down south where they get real weather! Not that tornadoes are always a good thing, but I find them to be pretty cool at time. I grew up in central Oklahoma/Texas and later in western Arkansas/Eastern Oklahoma, so I have dealt with tornadoes my entire life. Yesterday central Arkansas got hit by some gnarly storms [video of storm destruction]. My dad and several friends live in the area so I was worried when I heard (not till noon today however, the press is not really covering it, internet wise). My dad and friends are all ok. My friend Erica and her husband made it safely though the storm, although it pass about a block from their place from the sounds of it. My dads church lost part off its roof (it had lost more of the roof earlier this year in high winds, they had just replaced it). The storm took out a bank just north of my dad's house (less than a mile, you can see it from the back yard) and part of the roof off the wal-mart near it. Sounds like it really trashed the airport. I guess it was only a F3 though. I have many memories of tornadoes growing up where I did. The first one I remember was probably when I was 4 or 5 and we had to go hid in the basement of our church in Ponca City. I remember looking up in the sky wondering when the giant tomatoes were going to fall, since I thought my mom had said "tomato" not "tornado!" I remember sitting on my grandmas' porch and watching on go through a field out in the distance when I was probably 5 or 6 in northern Oklahoma... Seeing one go past northern Oklahoma City when we went to pick my mom up from work when I was a kid.... I remember when one came through Van Buren, Arkansas, in 1996(?95?) over Mothers Day weekend. The movie Twister premiered that weekend, so it was rather ironic. They decorated the theater with real tornado debris. There is one scene in that movie where they fly over an area that was hit by a tornado, and it happens to be a city in Oklahoma where my parents first lived after getting married. You could still see their old place. We use to chase after tornadoes when I was in high school for fun. I have ton's of tornado stories, but I will stop boring you now. Glad everyone made it though alright. I am sure we will have more over the next few months (just not here in the land-o-gray)! This is the animal that I work on at Augustana College! While most of his remains that have been recovered are prepared, we still have several blocks of unprepared material, and this is what I work on. The name Cryolophosaurus means "frozen crested reptile." The characteristic feature of this dinosaur is the large crest on the top of the skull, above the eyes. The nasal bones extend toward the back of the skull as ridges, and then join with the lacrimal bones to form a grooved crest which extends perpendicularly from the skull. Cryolophosaurus was discovered in the Jurassic Hanson Formation in the Transantarctic Mountains and represents the only theropod dinosaur to be found in Antarctica. Read more about Cryolophosaurus: Transantarctic Vertebrate Paleontology Project website. See more of my Cryolophosaurus pictures here. 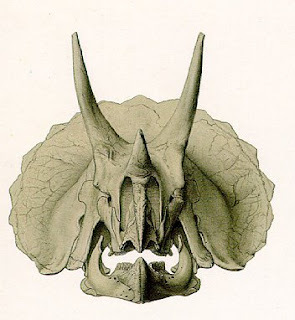 Ontogeny of cranial epi-ossifications in Triceratops. John R. Horner and Mark B. Goodwin. 2008. Journal of Vertebrate Paleontology 28(1): 134-144. Abstract: "Historically, the scarcity of non-adult Triceratops fossils collected from Upper Cretaceous sediments of North America limited our understanding and promoted controversy with regard to the morphology, and presence or absence of cranial epi-ossifications in the widely known horned dinosaur. The recent discovery of several exceptionally well preserved juvenile and subadult Triceratops skulls and numerous juvenile, subadult, and adult cranial elements, from the Hell Creek Formation of eastern Montana, confirms the ontogeny and morphology of epi-ossifications: epinasal, epijugal, epiparietal, and episquamosal. We describe the ontogeny and timing of the fusion of each of these epi-ossifications and the rostral from a cranial growth series. Although the timing is variable, the epinasal fuses first, followed by the rostral, the epijugals, the episquamosals, and lastly by the epiparietals. Co-ossification of the epinasal, rostral, and epijugals unites several of the anterior (rostral-nasal-premaxillae) and lateral (jugal-quadratojugal) skull elements. In combination with forward directed postorbital horns and massive fan-shaped frill, cranial epi-ossifications may have enhanced visual display and species communication in Triceratops." I'll admit that I am an internet junky. I have often wondered what adults did before the internet, other than talk to each other and read books ;) I know I am in a generation of people who are pretty connected to technology, if they want to be. The oldest person I know on Facebook is my mom and another person her age. But they are never on there (maybe once every two or three months). Same with Myspace. But being on the internet when your older if different than being on the internet when you are, say, three! So how old is to old to start letting your kids be online? It sounds like Facebook crack for a three year old! So, would you let your kid have one of these? Of is it to much to ask that kids play with normal stuffed animals and use their imaginations. Heaven forbid we take away their personal DVD players and make them look out a window on car rides! Sure, I am obviously not a parent, and I'll be the first to admit I do not know anything about kids. But has that much changed in the past 25-30 years?